Yes, it all looks and sounds delicious. John is especially fond of radishes; thx for the tip! Rutabagas were a dual use root vegetable on the farm where my Dad grew up in MN. They were used as supplemental animal feed and as a table vegetable. Dad planted some one summer in our garden and they quickly became one of my favorites. I have lots of radishes so will have to try a few pickled.A neighbor made like chicken salad with them omitting the chicken. That's a happy Gardner there. Working in the garden together priceless. I'd have to go with potatoes for myself...My dad used to grow so many turnips I got sick of 'em. I remember him yanking them out of the ground, knocking most of the dirt off, then eating them like an apple. The root veggies also help keep the soil fluffy!!! I'm not usually a radish person either, but I planted radishes this year to combat the bugs (at your suggestion!) and I have picked a few - they are delicious! I planted the Easter Egg variety. I wasn't planning on picking them, but the kids grabbed some and ate them, so I did as well. I guess I will be planting more! 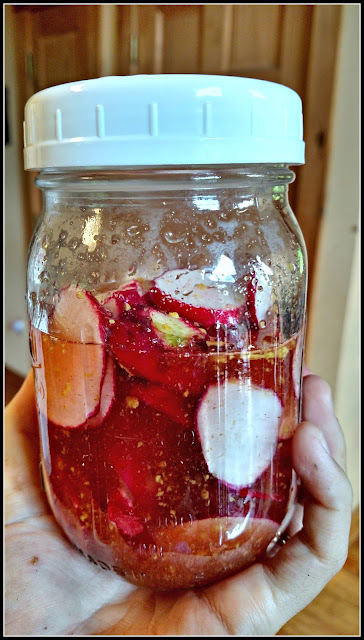 I like radishes--I've never tried them pickled, but they sound good. Your garden sure looks healthy. We have blooms on the tomato plants and are holding our breaths that we get some. We planted a bit late, but hopefully soon we'll have some lettuce. What a great picture, you can see his excitement from ear to ear! Perfect fun lesson in gardening here! Veggies look great!! 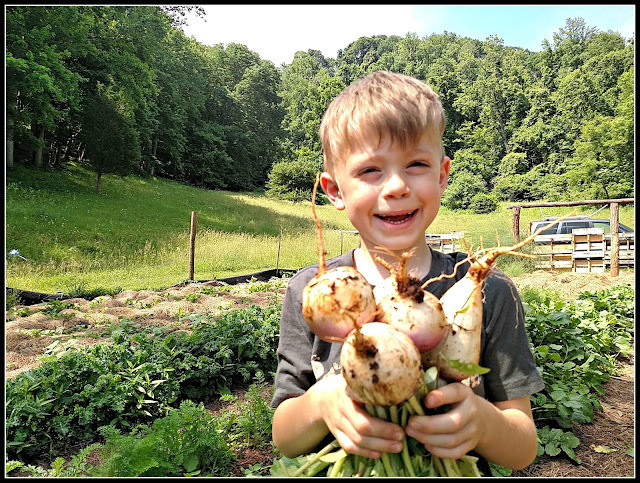 Did not know about radishes combating bugs... hubby never wants to plant them...plus I never heard of them pickled...will have to try them. oh wow.. what a beautiful harvest - you are so very blessed. You have a whole grocery store produce section in your garden! Phil loves radishes sliced thin in salads or just plain. I didn't know they control bugs! All I heave heard of is marigolds. What kind of bugs do you have? We have earwigs and stink bugs.But I don't know if they eat garden things. Oh my, yes! Love root vegetables....all vegetables. I just discovered this year that I like beets. I like radishes, but never tried pickled ones. I'll have to do that. That sure is a cutie pie holding those turnips. It has always been my curse not to be a huge fan of vegetables period. I think it's related to this slight case of OCD and having grown up with a garden and seeing what kinds of things grow in/around/happen to fresh produce. (I'm mostly the same way with fruit.) Anything pickled is usually great though. Look at that brilliant smile!!! Radishes . . YUM! I like radishes, I eat them raw. Sometimes seeing pictures of your kids reminds me of when mine were home. I sure do miss them. I discovered yellow beets this summer at our Amish neighbor's roadside stand. They're delicious! I never had pickled radishes, but they sound really good. Do you share the recipe? Pinterest recipes to the rescue. my grandma loved pickled beets. i eat a lot of radishes. in salads i pack for lunch or raw as a side to sandwiches. :) glad you found a way to enjoy them. hope you're having a great summer, lisa. Wow,, your garden is doing wonderful,, and Cort is sooo cute!